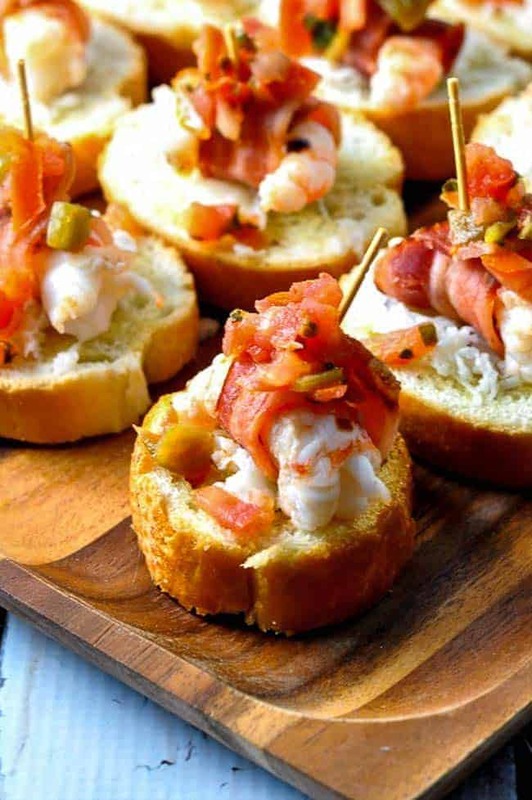 Bacon-wrapped prawns topped with fresh salsa and served on a crostini make easy and always popular tapas. 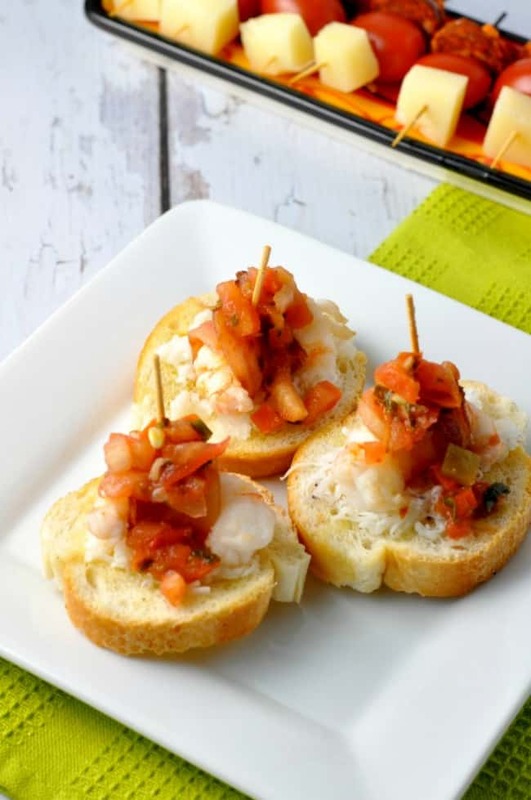 Fresh sweet prawns straight from the cold waters of the Pacific Northwest, smoky bacon and spicy salsa all served on a crispy crostini–these have been the first to disappear from the serving platter at our recent tapa parties. These bacon-wrapped prawns were my one of my favourite tapas during our recent trip to Spain. While I don’t indulge in bacon very often, it’s a treat that makes these tapas a sublime summer memory. I tend to be a lazy cook in the summer time. The thought of making a “real meal” just doesn’t appeal. So lately we’ve been eating the way I like best–a variety of little appetizers like these honey lime garlic wings or these stuffed mini peppers instead of a main dish. 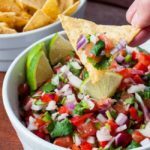 Eating tapas, or small bites, in the tapa bars of Spain taught me that I can make a completely balanced meal of appies. In hot weather, tapas are the ticket. And they’re fun to eat too. Tapa in Spanish translates to “cover.” Historically, a small piece of bread was used to cover the top of a wine glass to prevent flies from getting in. Later, bartenders realized that their patrons would stay a little longer (and drink a little more) if there was an interesting little bite of something on top of that slice of bread. Prawns or shrimp? Can I make bacon-wrapped shrimp instead? Prawns and large shrimp are interchangeable in this recipe. 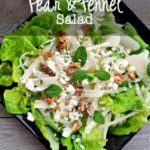 Both can quickly turn rubbery if overcooked. They only need to be cooked until they are no longer translucent and have turned pink. If you have the opportunity to purchase fresh local prawns, seize it. 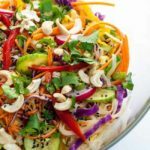 They are MUCH different than those large frozen shrimp that are sold in bags in the freezer section of your supermarket. Fresh-caught prawns are almost sweet and are bursting with flavour. And if you have extra, be sure to make these Gin-Gingered Prawns–another great appetizer that we love. 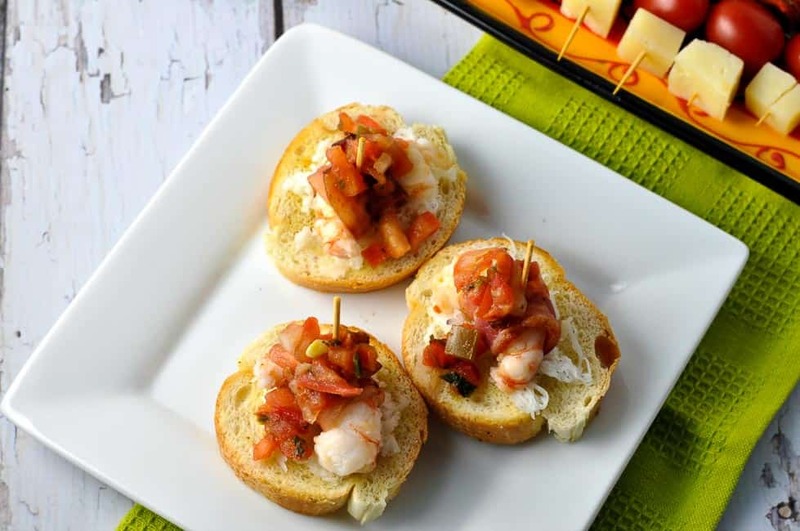 Bacon-wrapped prawns topped with salsa fresca and served on a crostini make an easy and always popular tapa. Make the crostini. Slice the baguette in 1/2 inch slices. Brush both sides with a little olive oil and place on a parchment paper lined baking sheet. Bake for 7 minutes. Remove the tray from the oven, turn the slices over and bake for another 5 minutes or until just slightly crispy. The crostini should still be soft on the inside. Cut the slices of bacon in half widthwise. Cook the bacon just until most of the fat has rendered but not until it's crispy. You will need it to be pliable so you can wrap it around the prawn. Drain and pat with paper towel to remove much of the fat. 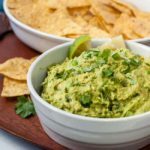 Increase oven temperature to 400°F. Wrap each shelled and deveined prawn in a half-slice of bacon and secure with a wooden toothpick. 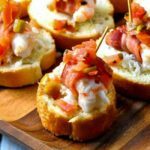 Place on the same parchment-paper lined baking sheet that you used for the crostini and bake for 5 minutes, just until the prawn has lost its translucent appearance, has turned pink, and the bacon is crispy. For crispier bacon, broil for 3 minutes, watching carefully. 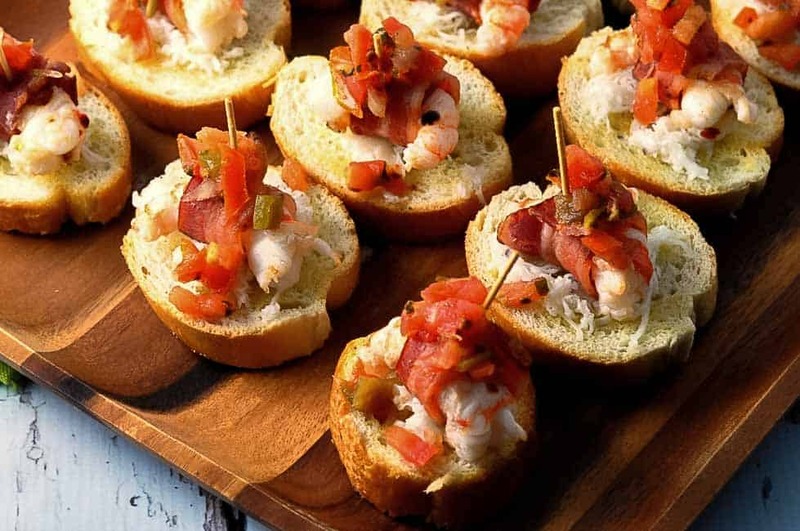 To serve, place each bacon-wrapped prawn on a crostini, spear with the toothpick and top with 2 teaspoons of fresh salsa.